For the third consecutive year Aleph Melbourne, the only organisation representing GLBT people in the Melbourne Jewish community, has not received an invitation to attend this year’s Victoria Police Jewish community reception. This year’s cocktail party was organised in conjunction with the Jewish Community Council of Victoria (JCCV), as it was in previous years. 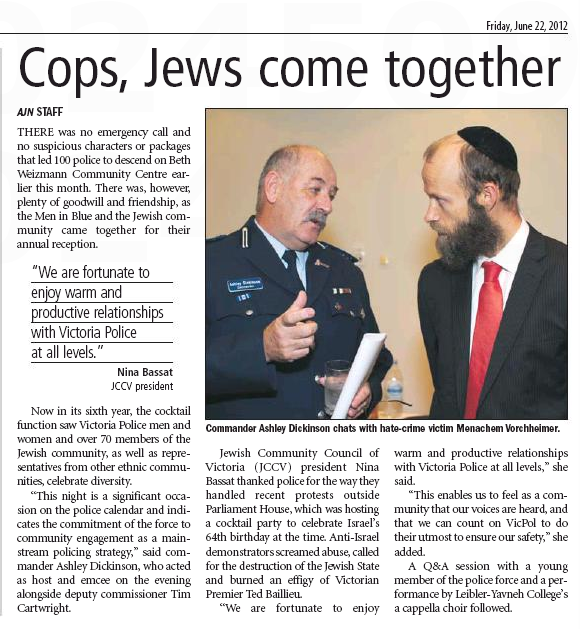 Aleph Melbourne was invited to the 2008 and 2009 Victoria Police Jewish Community reception dinners. The organisers invited those members of the Jewish Community who hadn’t been given an opportunity in the past to attend to represent their organisations. Giving the benefit of the doubt, it would be fair to say that with the number of organisations in the Jewish community, “the organisers” would have been able to include everyone they had previously overlooked in their 2010 and 2011 events. It staggers me to think that with 100 police and over 70 members of the Jewish community in attendance, there wouldn’t have been enough room to invite one more person. In their 2011 GLBT Reference Group report, the JCCV said that all community organisations should adopt a policy prohibiting discrimination and vilification based on a person’s sexual orientation and gender identity and that it was clear that Jewish members of the GLBT community are subjected to discrimination, harassment and abuse because of their sexuality. It would seem that the JCCV haven’t followed their own advice and Aleph Melbourne continues to be discriminated against by them and some of the wider Jewish community. I question whether there is some sinister motivation for the ongoing exclusion of the most vulnerable, marginalised, and excluded group of people from such an event. Victoria Police have not been able to come up with a credible reason why there has been such an “oversight” on previous occasions. Does Victoria Police have a policy of excluding GLBT organisations from these types of events? If not, why the ongoing exclusion? It doesn’t bode well for their liaison with the GLBT community. THERE was no emergency call and no suspicious characters or packages that led 100 police to descend on Beth Weizmann Community Centre earlier this month. There was, however, plenty of goodwill and friendship, as the Men in Blue and the Jewish community came together for their annual reception. Commander Ashley Dickinson chats with hate-crime victim Menachem Vorchheimer. Now in its sixth year, the cocktail function saw Victoria Police men and women and over 70 members of the Jewish community, as well as representatives from other ethnic communities, celebrate diversity. “This night is a significant occasion on the police calendar and indicates the commitment of the force to community engagement as a mainstream policing strategy,” said commander Ashley Dickinson, who acted as host and emcee on the evening alongside deputy commissioner Tim Cartwright. Jewish Community Council of Victoria (JCCV) president Nina Bassat thanked police for the way they handled recent protests outside Parliament House, which was hosting a cocktail party to celebrate Israel’s 64th birthday at the time. Anti-Israel demonstrators screamed abuse, called for the destruction of the Jewish State and burned an effigy of Victorian Premier Ted Baillieu. “We are fortunate to enjoy warm and productive relationships with Victoria Police at all levels,” she said. “This enables us to feel as a community that our voices are heard, and that we can count on VicPol to do their utmost to ensure our safety,” she added. A Q&A session with a young member of the police force and a performance by Leibler-Yavneh College’s a cappella choir followed. You are currently browsing the mikeybear blog archives for Jun, 2012.